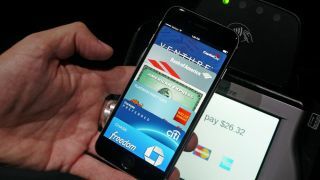 MasterCard has welcomed Apple to the payments world, and pointed to the mobile phone as one of the things that should help solve a multitude of problems. Speaking to TechRadar at the launch of Transport for London's contactlesscard payment system, MasterCard UK and Ireland president Marion King told us that it was an exciting time as technology changes the way we pay for things. "So it shouldn't be about 'what telco or what bank am I with?' but more that when you get your card or phone out of your pocket it's got to work. "We welcome partnerships - you need competition in the market. We're obviously involved with Apple which is quite right - they are a big brand and we're happy to be a partner." One of the big issues in payment currently is the problem with 'card clash' - with NFC's technology falling short of differentiating between cards. But King is keen to see the latest technology start to solve these problems as we get used to keeping our various payment cards separately or being more careful with how we touch card readers. "It's definitely a challenge, a practical challenge, and I think technology will move it forward," she said. "Things like contactless on a smartphone help - allowing you to choose a default payment card. All of these usage problems are something that we have to work through."